At breakfast on Friday morning, I ran into Katrina and her family, back from their trip around the country. It was good to see them and we spent awhile catching up. They recommended that I visit the Sulemaniye Mosque (Süleymaniye Camii) since I was going to be in that area. While we were talking, a couple eating breakfast overheard us and started asking questions about Turkey and public transport. They had just arrived that morning from Capetown, South Africa. We explained the workings of the buses and how to get around to them, then went our separate ways. Katrina and her husband had already arranged for an airport transfer from the travel agency across the street, so after breakfast, I hurried over there and got a ticket for 8 lira. You can tell when you’re getting close to the Egyptian Spice Market in Istanbul – the smell of cloves and cumin and cardamom just about knocks you over. Once you enter, the visual effects add to the aromas. Everywhere you look are heaping piles of spices in all colors – golds, browns, reds and greens. Some of the vendors sold teas as well and their lemon and orange fragrances added to the intoxicating scents. You could also buy teapots and glasses, cheeses – even henna for dying your hair or decorating your body. I wandered through the small aisles, drinking in the heady aromas and finally settled down at a stall that seemed to be selling mostly to locals. I picked up some spices and teas to take back with me. The Sulemaniye Mosque was nearby so I headed there next. The mosque is in a larger walled complex with lots of grass and trees. 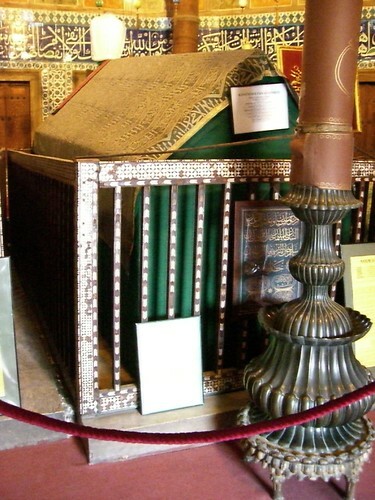 I stopped off first to visit Sulemaniye’s tomb, which is in a separate room. The tomb is nothing ornate as you can see – all of the tombs I have seen like this have a similar “roof” on top. Once at the mosque, I had to borrow one of the scarves left there for visitors to cover my head. Leaving my shoes also outside, I headed on it, right behind a German guy wearing a skirt. Since both men and women must have their knees and shoulders covered, you must wrap a long skirt around you if you’re wearing shorts. The mosque was beautiful and much less crowded than the Blue Mosque. Visitors had to stay behind the barricades that separate the praying area, but we could still see the large expanse. After visiting the mosque, I walked down the hill to the Emininou harbor area and caught the tram back to Sultanachmet. I grabbed a quick lunch at an outside cafe (today was “kofta” – meatballs made of minced lamb). As I walked across the park towards the hotel, I noticed a group of men congregating by a small camii. Just then, the call to prayer came across the loudspeaker. The call to prayer is heard at dawn, at midday, about the middle of the afternoon, just after sunset, and at night fall about two hours after sunset. 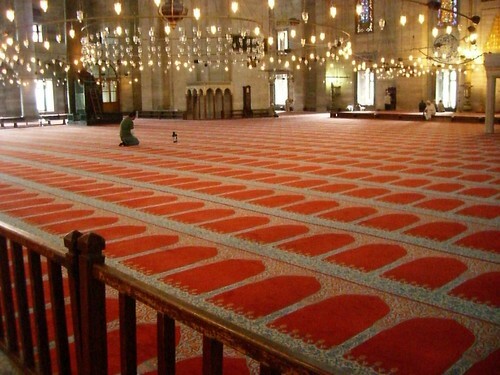 However, on Friday, the obligatory congregational call to prayer around midday means that Muslims come together to pray. Dozens of men hurried over, removed their shoes and then laid out their prayer rugs to kneel on. While the prayer continued, the men knelt or sat and listened. One family walked over together but the husband left to pray and his wife had to sit on the side with their son. It seemed ironic that this woman who is so overtly religious in her attire is not allowed to pray with the men. I had to go back to the hotel to change my room – actually, to change my hotel. As I mentioned earlier, I had mixed up my dates and the Hanedan did not have a room for me the last night. However, they were nice enough to find me a room at the Hotel Emre, which was about 20 feet down the street. They even carried all my luggage over to the hotel. My new room was smaller but had a TV and 2 twin beds. 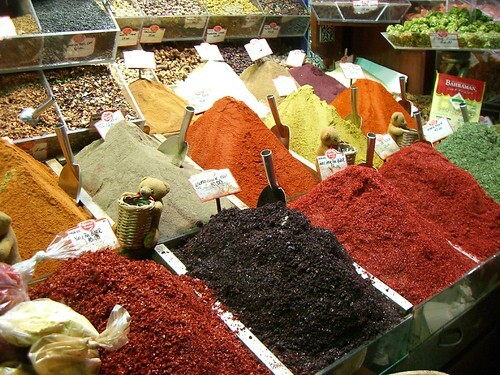 I left my spice purchases behind and headed out again to the Grand Bazaar. The Grand Bazaar was fairly easy to get to – it’s right off the Beyazit exit if you take the tram. The bazaar was just as overwhelming today as it was yesterday – vendors were chanting about their “deals” and trying to draw tourists into their shops by asking questions. It’s easy to get lost in here – in fact, it’s part of its charm. I deliberately headed into the maze and didn’t emerge for several hours. By 6 pm, I had bought several charming items and was ready to sit in a cafe and watch the rest of the world shop. After resting over a glass of tea, I headed back to the hotel – I was meeting Robert and his family for dinner. My friends from Hawaii and the Philippines, Robert, his wife Natalia and her cousin Alicia, were back from Izmir and Cappadocia, so we had arranged to meet that evening. Mindy, Natalia’s sister, didn’t join us but the 4 of us headed for a nearby restaurant. My chicken dish was very good and the wine was the best I’ve had since I got to Turkey. We all discussed our forays into the country and promised to exchange emails and photos after we got back. This entry was posted on May 20, 2007 at 1:35 pm	and is filed under Turkey. You can follow any responses to this entry through the RSS 2.0 feed. You can leave a response, or trackback from your own site. If ever you go back to Istanbul, you ought to try out the Marmara Hotels or better, their residencies. If you’re sharing they can be as low 75 euros. Between 2 people that’s practically nothing. The other thing is, you get what you pay for. You only get so many days a year off work, so why skimp on the money and have a bad holiday! A great cultural holiday though, that’s why I love going there!